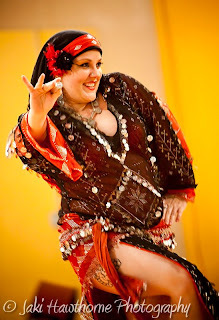 This weekend's metro Atlanta belly dance events include late-breaking workshop at AFBD and an exciting lineup for the second "Night in the Oasis" show in Oakhurst. If you've been wanting to learn more about classic popping and locking -- whether to fuse it with belly dance or to bust some hip-hop moves -- don't miss the "Popping 101: Fundamentals of Popping" workshop at Atlanta Fusion Belly Dance, Saturday at 2:00. In this workshop, MonTahje will cover the history and origins of popping, and break down how to incorporate muscle isolation, coordination, slides, position, freezing, waving and more into your dance routine. Suitable for all level dancers, in all styles of dance! Passes are $25 in advance, $30 at the door. RSVP to the Facebook event or visit AFBD online for more details! Saturday evening, Kavarna in Oakhurst will be the place to be! "A Night in Oasis: Fire in the Oasis," produced by Mina of Dalloua and Mariana, will feature an impressive lineup of local and regional raqs talent. Dancers slated to perform include Amani, Christy, Crystal, Danita, Faaridah, Gretchen, Jendayi Belly Dance, Kira, Lady Morrighan, Miss Mongoose, Moriah, Neyali, Perry Dance, Raja, Samora, Saniyah, Shannon, Stellanura, Sundari, Tamar, and Yasmini. Get there early, because Kavarna is a small venue and seating is very limited! Doors open at 7:00, and the show starts at 8:00. Cover charge is just $5.00, and there will be food, wine, beer, and coffee available. Kavarna is located at 707B East Lake Drive, Decatur, GA 30030. Don't Miss the Crossroads & Origins Show!